Most commercially available videoconferencing and telepresence systems have cameras on top of the displays which means people look down while conversing. Imagine a news anchor that never looked into the camera; you would quickly tune out and turn the channel. This is the same for telepresence systems that mount cameras above the displays. Looking down and away is the common experience people have with telepresence. Despite marketing claims that these systems have eye contact, they actually do not. Resellers of telepresence often cheat this weakness by gazing into the camera while doing demos to make an eye contact connection and the buyers find out later that the experience was not what they thought they were buying. Other manufacturers and resellers actually mount their cameras in front of the displays blocking the image in the demo client’s conference room to provide a better camera view to the far end where the unsuspecting telepresence buyer never knows the reality behind the scenes. 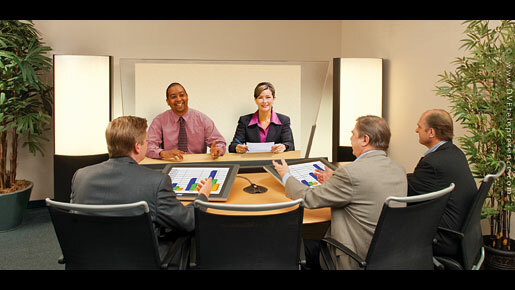 Even more profound is the lack of eye contact in very expensive multi-screen videoconferencing rooms. These systems make up only a small part of the overall industry, yet, in the minds of the uninitiated to all things telepresence, the eye gaze is horribly off. Not only do people appear like they are looking down, they also appear to look up to 30 degrees off left and right. Eye contact is important because it is the chief of all non-verbal communication cues. Some behavioral researchers have claimed that non-verbal communication constitutes as much as 80 percent of the message we express. When the camera is on top of the display, we appear to be looking down and viewers recognise this distraction. The unintended result is videoconferencing and telepresence that makes us look like we have a “gaze avoidant” complex. Studies have shown that gaze avoidant people are perceived as being less attractive, untrustworthy, and less intelligent. Hardly the thing any of us want to communicate during a business meeting. People cope by recognising the limitations of videoconferencing and telepresence and just block these negatives out and proceed with the call. But at what cost to the quality of our communication? At what expense to productivity? And at what expense to building more effective teams? Many eye contact display systems have been proposed over the years but they have not reached commercial viability due to cost or performance issues. An old approach used large boxes with hoods above making people look like they are in a tunnel. The lack of attractive industrial design made those telepresence systems unusable for corporate communications. One manufacturer that has broken out of the box of common videoconferencing and telepresence is DVE Telepresence. DVE Telepresence is the winner of numerous industry awards and the leader of many key innovations in the field of conferencing. It has won European CEO’s “Telepresence Innovator of the Year Award” for 2010. DVE Telepresence provides room solutions such as the DVE Huddle 70 that upgrades Cisco, Polycom, Life-Size, Vidyo and Radvision codecs to real telepresence. The client is not forced to change the codec provider but rather DVE reinvents what they have into something much better with hidden eye-aligned cameras behind the images. These room upgrades have been installed for leading companies in over 20 countries. The DVE Huddle 70 is the premiere choice for executive communications. With increased user satisfaction, people enjoy using the DVE Huddle 70 for more meetings and for longer periods of time, increasing return on investment for telepresence. DVE Telepresence has also taken telepresence beyond the corporate meeting room and into both the corporate training room and presentation room with a new generation of augmented reality holographic displays. Augmented reality takes common 3D to the next level. It places amazingly realistic video images of people and objects into the middle of the room. Now executives, athletes, famous personalities, and corporate trainers appear to actually be in the room and not confined by a display screen. These augmented reality solutions are purpose-built to specific client requirements, ranging from small room solutions to podiums for large public events to huge stage effects. Liam Neeson was recently witnessed holographically at a London press event on the DVE Telepresence Stage. Jeff Wayne’s musical version of “The War of The Worlds” returns to major arenas, promoted by Live Nation and SJM, with another technological leap forward, with Liam Neeson as a hologram, made possible by DVE Telepresence.